What's New in the Softimage 2012 Subscription Advantage Pack? The Zoom on Cursor preference now affects all navigation tools in all views that support zooming. There is a separate Zoom on Cursor preference for zooming with the mouse wheel. See Camera Preferences. An annotation object is a text balloon that can be used to communicate messages to colleagues who are working on the same scenes and models. Annotation objects can be selected, transformed, and parented like any other 3D object in the scene, so the balloon can point at specific elements in the viewport. See Annotation Object. You can Shift+double-click to select loops and ranges (Quick Loop). The Alt key workflow is still supported. See Selecting Ranges and Loops of Components. You can double-click on a polygon to select a polygon island. Press Shift to add to the selection, Ctrl to toggle, and Ctrl+Shift to deselect. Note that Shift+double-clicking is also used to select ranges and loops. If a range or loop selection is possible in the circumstance, it will take precedence. There are new commands on the Select Select Loops menu. See Modifying Range and Loop Selections. Loops From Selection extends the selection as far as possible in both directions. For border edges, it extends across junctions where three edges meet but stops at any other junction. Loops From Selection (around corners) is similar to Loops From Selection, but in the case of border edges it selects the entire border. Grow Loops extends the selection by one component in both directions if possible. Shrink Loops reduces the selection by one component in both directions, until only one component remains. If a closed loop is completely selected, then an arbitrary component is deselected. Select Select Polygon Outline selects the edges on the outline of the selected polygons. 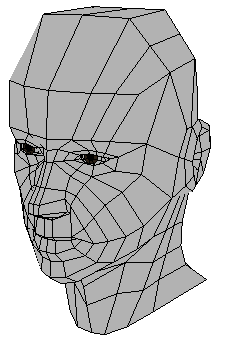 See Selecting Polygon Outlines. Select Island From Selection selects all components in the same island as the current selection. See Converting Selections to Islands. Using the Rectangle tool and clicking without dragging selects the closest element. This was always the case for objects, but now it works for components as well. You must click and drag to select all elements under the pointer. You can access the Selection Preferences from the Select menu. In addition, the Surround Edges, Surround Polygons, and Raycast in Shaded Mode options are all available as toggles directly on the menu. The Include Backfacing Polygons preference is on by default. The Show Snap Targets preference toggles the display of points and other targets for snapping. See Snapping Preferences. The FBX plug-in for Softimage uses version 2012.2 if the FBXSDK. The Extrude Normal operator extrudes, duplicates, and insets components while retaining proper mitering at corners. See Copying Components Along Their Normals. The Apply Thickness compound solidifies polygon mesh objects by adding thickness, similar to the Shell modifier in 3ds Max. See Apply Thickness. Modify Poly. Mesh Spin Edges "rotates" edges by cycling their endpoints around the vertices of their two adjacent polygons. See SpinEdge Op. The Add Smooth Edge Loop tool splits parallel edges across quad topology while preserving the original surface curvature continuity. The SplitEdge and SubdivideEdge operators have options for Curvature Continuity. 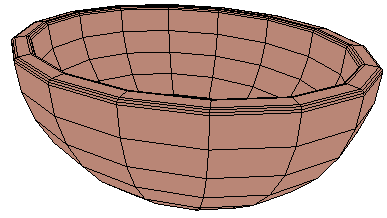 The Apply Slice Between Two Vertices compound adds a range of edges intersecting all other edges between two points on a polygon mesh. 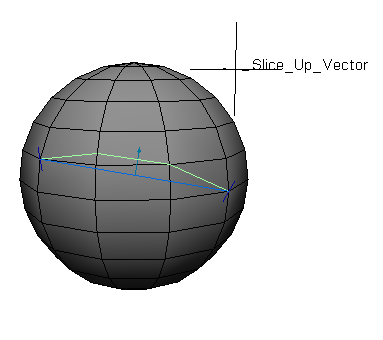 See Apply Slice Between Two Vertices. 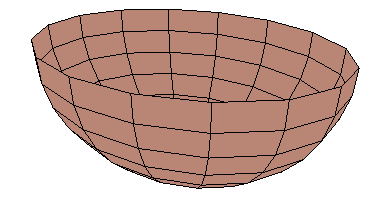 The Cap Hole compound fills a hole in a polygon mesh. See Cap Hole. The new Include Animation Layers option in the Store Action dialog box allows you to bake animation layers into the base layer's animation when you store an action. See Collapsing or Storing the Animation Layers for more information. The new Highlight Active Viewport and Timeline preference in Animation Preferences lets you set a highlight around the active viewport and the timeline when autokey is on. You can also select the highlight color. There are some new faces on the block! New polygon mesh character envelopes with predefined UVs are available in the Get Primitive Model menu: Mesh - Bull, Car, Fish, Horse, Lizard, Male, and T.rex. There is a new option in the Brush Properties to turn off normalization when painting weights. It is also linked to the existing Normalize option in the weight paint panel. You can temporarily turn this off to remove some weight from an existing deformer in order to add weight for a new one. You can define layouts groups for exposed input ports using the interface. See Grouping Ports in the Layout. You can define callbacks that get executed automatically when users open and interact with the compound's property page. See PPG Logic. Randomize Around Value now works properly with non-scalar values and arrays. You can now set data on the EdgeCrease attribute. The Particles Create Rigid Bodies command on the ICE toolbar now uses the Simulate Bullet Rigid Bodes node instead of the Simulate Rigid Bodies node. ICE Simulation Subframe Sampling is now supported for both the Simulate Rigid Bodies and Simulate Bullet Rigid Bodies nodes. There is now documentation for the Init Timers compound - see Setting Particle Timers for information on how to use it. The Bullet physics engine (v2.78) has been integrated into ICE as the Simulate Bullet Rigid Bodies node. You can use convex hull approximations of a particle's instanced shape's geometry as the collision geometry. 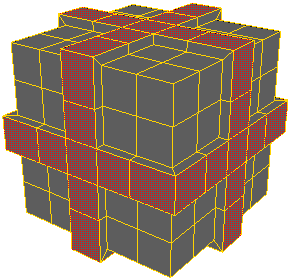 You can also use a bounding box shape for quicker but less accurate collisions. 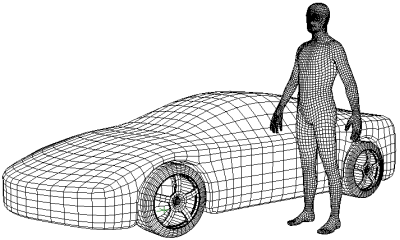 See Collision Geometry for Instanced Shapes. 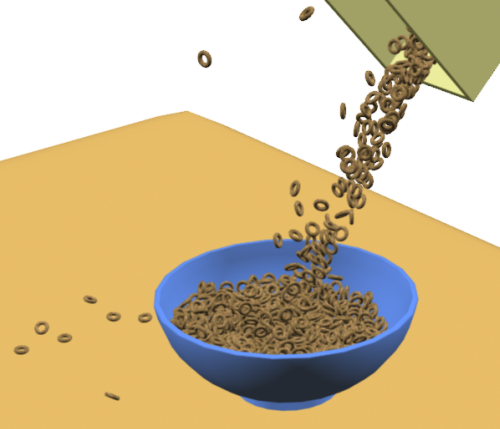 A bounding cone shape is used on particles set with the Cone shape (bounding capsules are used for cones with the Simulate Rigid Bodies node) - see Collision Geometry for Basic Particle Shapes. If Bullet detects a valid CUDA™-enabled GPU in your system, GPU acceleration is used for the broadphase collision detection process. This is available on Windows only. CUDA (Compute Unified Device Architecture) is NVIDIA's parallel computing architecture. Static and dynamic friction are not recognized separately by Bullet: it combines the two to support just one friction value (Static Friction) - see Setting the Elasticity and Friction. The Elasticity value for collision objects can be higher than 1: it is not clamped to 1 as it is in the Simulate Rigid Bodies node. Values higher than 1 will create energy upon collision, which is an effect that you may or may not want. High values can sometimes create instabilities in the simulation. Springs and dampers are not supported by Bullet. Create Extrusion Along Strands has been updated with new options. The new Deform Strand Extrusion compound lets you use Create Extrusion Along Strands in one tree to create the geometry, and deform it in another tree. See Creating an Extrusion Along Strands. The default Transform Mode for Get Topology is now No Transform. Merge Polygon Meshes now has a Transform Mode option. The new Apply Thickness, Apply Slice Between Two Vertices, and Cap Hole features are implemented with ICE compounds. The transform port (Texture SRT parameter) of the Edit UV shader can now be driven by connections in the render tree.